← SARGASSO #1 NEARLY SOLD OUT! Here is the third ad which appeared at the back of the 1921 edition of CARNACKI, published by Holden & Hardingham. 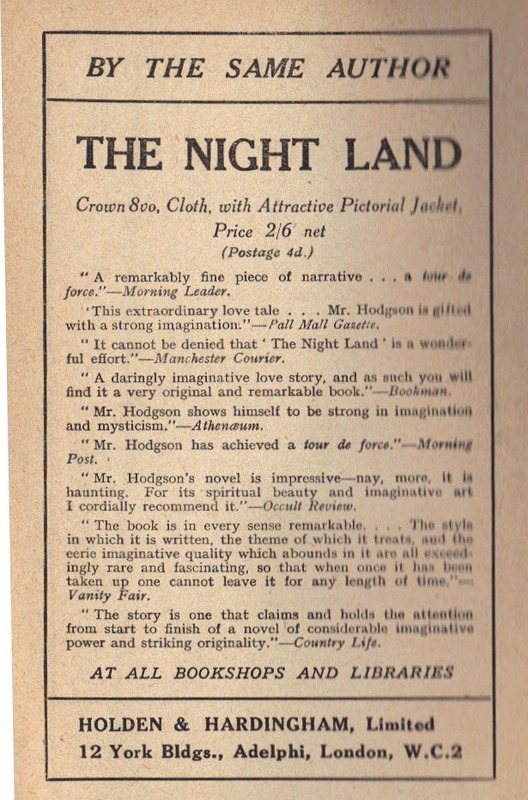 This time the ad is for Hodgson’s THE NIGHT LAND which, even back then, may have been a difficult sell to uninformed readers. I wish that we knew the circumstances under which H&H reprinted all of the Hodgson’s books in 1920-21. Why did they do that? How did it come about? Sadly, like much of Hodgson, we will probably never know. A transcription of the ad follows the graphic. with a strong imagination.”–Pall Mall Gazette. Hey, that sounds pretty good! Actually, I’ve read ‘The Night Land’ but only once, and that was over 30 years ago. Stayed with me, though. I am actually impressed by the range of the reviews listed here. I’ll have to try and track them down and see if there is more to them.